Richeeze: Grilled cheese and more, such as the Bacon Mac (sweet Hawaiian bun grilled with our Richeeze mac and crispy Applewood smoked bacon) or Ally’s Special (sourdough bread with marinated Portobello mushrooms, fresh mozzarella cheese and pesto sauce) or Jalapeno Popper Melt (sourdough bread grilled with stuffed jalapenos, pepper jack cheese, fresh tomatoes and grilled onions). Visit: richeeze.net. Pinch of Flavor: tacos, burritos and quesadillas, with vegan options available. Specialties include the lobster quesadilla (grilled lobster with avocado cilantro and blueberry chipotle sauce), nachos (fresh chips with grilled onions, meat of your choice, melted Monterey Jack and side of fresh homemade guacamole and a pickle jalapeno) or Philly Sandwich (steak with melted Monterey Jack grilled jalapeno, onions and spicy mayo on ciabatta). Baby’s Badass Burgers featuring the classic Original Beauty with Swiss, grilled onions, sautéed mushrooms and Baby’s special sauce. Visit: babysbadassburgers.com. Cousins Maine Lobster, which specializes in lobster rolls and tacos. Visit: cousinsmainelobster.com. Hungry Nomad’s menu features flavors from the far corners of the globe, with American, Mediterranean and European influences. Try a zaatar wrap, spinach salad, fattoush salad, fries or a beef pocket. Visit: hungrynomadtruck.com. India Jones Chow Truck serves authentic Indian food. Look for chaats, curries and naan. Visit indiajoneschowtruck.com. Greenz on Wheelz specializes in salads and melts. Ten salads including Chinese available. Visit: mibpizza.com. Me So Hungry includes an eclectic menu of PB&J burger (peanut butter, jelly, sriracha, bacon and cheddar on a burger), KTM sliders (marinated short ribs, pepper jack cheese, crispy onions and spicy crème fraiche) or Portobello mushroom burger (Portabello marinated with miso, balsamic, house-herbed goat cheese, fried onions, tomato and garlic green peppercorn). Visit: mesohungrytruck.com. Richeeze, grilled cheese and more (see description above). Visit: Richeeze.net. 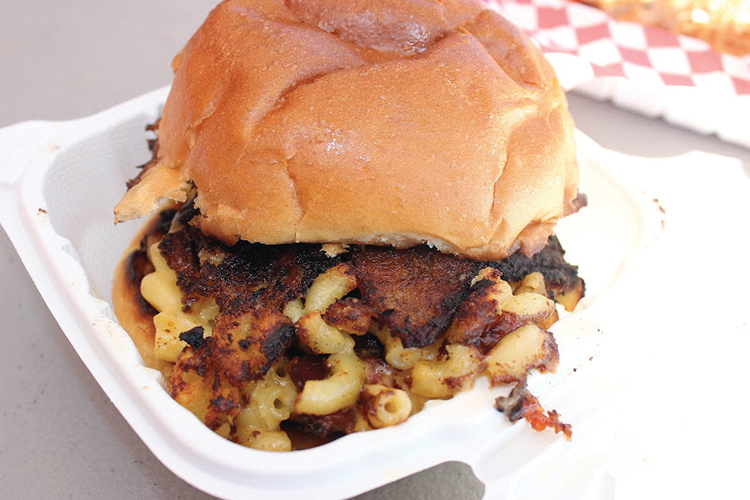 The Bacon Mac from the Richeeze truck will be available at the parade and concert. Sabores de Mexico specializes in gluten-free, vegetarian and organic Mexican gourmet food. Visit: facebook.com/saboresde-mexico.us. Palazzolo Truck, which serves gelato and sorbetto. Visit: palazzolotruck.com. Cool Haus serves architecturally inspired ice cream; some of the flavors available are blueberry sweet corn, chocolate peppermint, cinnamon cookie dough or cookies & sweet cream. Interesting cookies are also featured. Visit: eatcoolhaus.com. Matt’s Coffee Express specializes in blended coffee or tea drinks, such as hazelnut, chai, or matcha and fruit smoothies, such as strawberry/banana, berry treasure, coconut and mango. Visit: mattscoffeeex-press.com.